There is a good reason why people tell us to breathe when we are stressed or upset about something. Practicing deep breathing exercises is one of the best things you can do for stress relief. When we are relaxed our breathing is steady, calm and measured. Breathing in this way during times of stress reduces the above symptoms telling our bodies it is time to calm down. It’s free! No paying a fortune for fancy therapy. It doesn’t take up a lot of time. All you need is 5 or 10 minutes. You don’t need any equipment. Just your lungs! The techniques are pretty easy to learn. The advanced ones may take a little practice though. There is a wide range of breathing exercises. You can try some out and choose what works best for you. Abdominal or diaphragmatic breathing can strengthen your diaphragm muscles and can result in you breathing much more efficiently. This basic technique is easy to learn and can be great for calming you down. Place one hand on your belly (just below the ribs) and one one your chest. Inhale through your nose and allow your belly to push your hand out. Your chest should not move at all. Breathe out with your lips pursed, making a whistling noise. The hand on your belly will go in. Use this hand to push the air out. Repeat this 5 to 10 times. Take your time with each breath. This is another really easy technique to learn. It can be done almost anywhere and can reduce stress and ease anxiety quickly. The purpose of this exercise is to ensure the lengths of the inhale and exhale are equal. Balance is extremely good for the body. Sit in a cross legged position on the floor. If this is not possible a chair will be fine. Do not change your breathing at first just pay attention to your natural breath. Do this for at least 5 breaths. Inhale slowly for a count of 4. Pause at the top of the breath for a count of 1. Then slowly exhale for a count of 4. Pause again for a count of 1 before you repeat the exercise. Continue this breathing pattern for several minutes. With practice you may increase to a count of 6 or 8. Upping the level a little, this technique can relieve stress and calm your mind after just a few minutes. Alternate nostril breathing can improve our ability to focus, support the lungs, help remove toxins, and settle stress. Sit comfortably and make sure your spine is straight. Take a deep breath in and out through your nose. Inhale slowly through your left nostril. Close the left nostril with your left thumb and hold the breath for a count of 1. Open the right nostril and exhale slowly. Pause for a count of 1. Inhale through the right nostril. Hold both nostrils closed for a count of 1. Open the left nostril and exhale. Repeat for 5 to 10 cycles. When you feel anxious, you will often find your exhalations getting shorter. 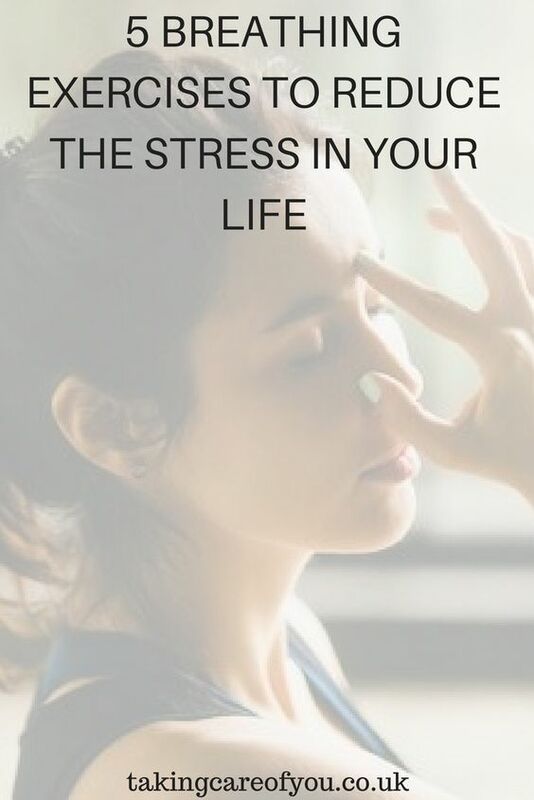 This will increase stress. This technique focuses on the exhale and is extremely calming. Sit comfortably with your head and upper body aligned. Focus on breathing through your abdomen. Start to inhale for a count of 3 and exhale for a count of 3. Start to deepen your exhalation. When you are ready begin to adjust your breaths. Inhale for a count of 2 and exhale for a count of 4. Focus on a smooth transition between the in breath and the out breath to avoid gasping for air. Do this for as long as you feel comfortable. Working up to 5 minutes. This last one is a bit trickier but gets easier the more you practice. It is preferable to be lying down for this exercise but it can be done in other positions. Always breathe in through your nose and out through your mouth when practicing this technique. Place your left hand on your abdomen and your right hand on your chest. Breathe in to fill your lower lungs. Your belly will rise and push your left hand up. Breathe out and your hand will fall. Repeat the last 2 steps 10 times. Now, breathe in as before but do not stop after your left hand rises. Continue to inhale and your chest will rise and push up your right hand. Your left hand will fall slightly. Breathe out slowly through your mouth. Both your hands will fall. Repeat this exercise for 3 to 5 minutes. Some people get dizzy when they first try roll breathing. If this happens, slow your breathing and slowly get up. 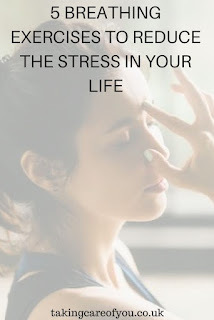 I have tried all of these techniques in times of stress and personally find that equal breathing works best for me. We are all different so I would advise that you give each one a try and go with what feels right for you. Let me know how you get on.